For Metal core PCB / Aluminium PCB manufacturing process, people should pay attention to the artwork manufacturing, Metal materials preparation, image transferring, etching, surface treatment and profile, etc. 1) Due to the existence of the side etched, and must meet the accuracy of trace, thus, it must do some compensation when manufacturing metal core pcb artwork, also compensation must be confirmed according to the value of side etched with different copper thickness, the artwork is negative. 2) Try to use the fixed size of 400 * 450 mm, and the surface of Aluminum board size should have protective film. 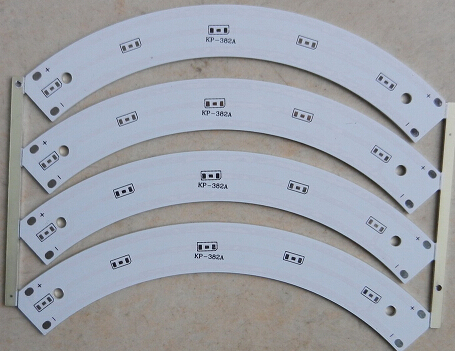 3) During the process of aluminum PCB layer image, it usually use 0.3 mm epoxy board, which the size is the same as the aluminum PCB board, and use the tape to blockade and compaction to avoid solution infiltration. After the treatment on copper surface, the best way is to use the chemical micro etching, and then after bake it should deal with wet film to prevent oxidation. 4) In the process of etching in Aluminium PCB manufacturing, need to use test boards to adjust the solution to ensure the best etching results. 5) After etching on Aluminum PCB, the best way is to use SN solution to do strip immediately.